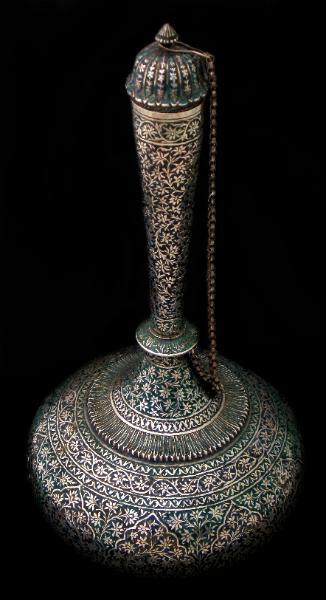 This beautiful Islamic flask or surahi from northern India, most likely Kashmir, has been chased all over with small floral motifs within repeating bands and lobed cartouches. The background has been finely filled with blue and green enamel. The bottle has a low, globular base which rises to a slender, gently flaring neck. It stands on a low, ring foot. The bottle retains its original stopper and chain. The stopper, reminiscent of a Mughal architectural dome terminates with an etched lotus bud finial. It is attached by the chain to a raised ridge on the lower neck. Such a flask was used to hold water for drinking or wine or liquors. Persian wine and liquors were highly prized in the 18th and early 19th century Mughal capitals of northern India. The condition is fine and reflects the item’s age: there are relatively minor losses to the enamel, and some minor dints. 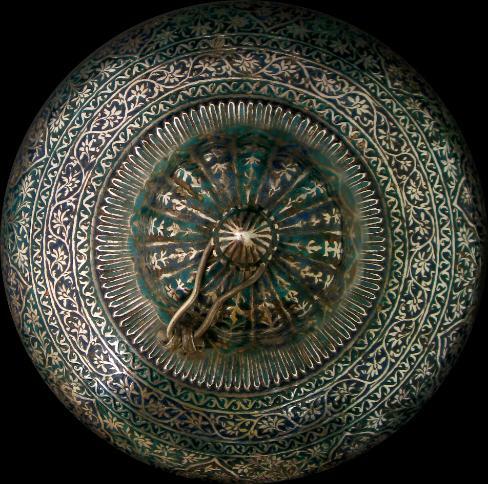 A smaller surahi of similar form with blue and green enamel work is illustrated in Terlinden, C., Mughal Silver Magnificence (16th-19th centuries), Antalga, 1987, p. 115.